During the Olympics, Food52 had a contest asking for our best pub food. Thinking back to college and the alarming things we ate at two in the morning, I recalled the gooey baskets of waffle fries topped with bacon, sour cream, cheese and ketchup. They came out crispy and hot and slowly sogged out a bit as you got to the end. I’m sure I had fitful sleeps cured by sleeping in until 10 or 11 and a metabolism to save me from a Senior 70. As I pondered those crispy, gooey baskets my thoughts turned to a more grownup, but still ridiculously fatty version we had in Austin at the Chi’Lantro truck. Caramelized Kimchi, a mound of sizzling Korean BBQ, chopped grilled onions, cheddar and Monterey Jack cheese, cilantro, magic sauce, sriracha and sesame seeds. All set on top of a pile of crispy French fries. And the way my brain works, chewing slowly on ideas, making up convincing arguments to do exactly what I first thought I shouldn’t do (buy that new electronic device! order tickets to the fancy tasting menu dinner event! make something super complicated for dinner when you have no time at all!) I found myself guiding my sister and her family to the magic Chi’Lantro truck for dinner. And there it was waiting in one of many permanent-looking food truck parking lots in Austin. Surrounded by picnic tables, happy people drinking big beers from the bar next door, the cheerful fellas beckoned us over to order up some sticky, fatty, gooey, crispy piles of french fry love. We ordered two kimchi fries and two Korean burgers (Homemade buns, Bulgogi, grilled onion and cheese, soy vinaigrette salad, magic sauce, and an option of fried egg) and sat waiting with our number as happy people munched and slurped around us. And when our food arrived and we each dug in with a fork, there were only happy chewing noises to be heard. Those flavors worked and they were addictive and paired with a giant beer I knew I’d be taking a nap instead of going for a run like my sporty relations. Alas. When in Austin, eat and do what I want. Flash back to the Olympics, the pub food contest, me recalling the kimchi fries. Me chatting with my foodie boss, bouncing ideas around. Together coming to the conclusion that the dish would be sweet potato fries topped with smoked tea pork and a sriracha mayo. Something you should only eat a small portion of, but something I ended up eating as a platter for dinner that night, the leftover pork going directly into the freezer for a later date when I had maybe found time to work it off somehow. Cut pork into large chunks and brown in batches in the pot of a pressure cooker (or large pot). Remove to a bowl and add onions, garlic, ginger and black beans to fat. Stir for a few minutes. Steep tea in boiling water about 5 minutes. Remove tea bags and add soy, maple syrup and sherry. Add to onion mixture, scraping up any brown bits on bottom. Return pork. If using pressure cooker, cook on high for about 20 minutes, then place in sink under cold water to release pressure. Otherwise, cover and simmer over low for about an hour and a half or until pork is very tender. Remove lid, crank up heat and reduce sauce to a glaze. When cool enough to handle, break/shred pork into smaller pieces. Heat 2″ of oil in a heavy bottomed pot to 375. Add a small batch of fries and cook until the edges start to crisp. Remove to newspaper or paper towels. Make sure heat is around 375 and add fries again until browned. It happens fast so pay attention. Drain on paper towels, then toss in bowl with salt, and a bit of cilantro and green onion. Finish cooking remaining sweet potatoes. Mix mayo, mushroom powder, sriracha, soy and lemon, adding just enough water to make it drizzle-able. 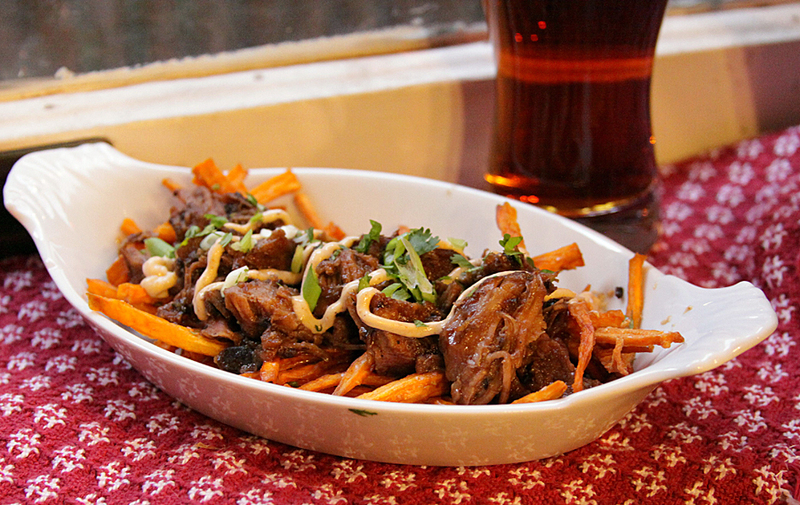 Place a mound of fries on a plate, top with pork, a drizzle of mayo and an extra sprinkle of cilantro and green onion. Eat with a fork, right away. If you don’t have a group partaking in this dish, there will be leftovers. As mentioned, the pork is great over rice with something simple and green like broccoli or kale. I usually freeze a packet or two for later. You can also use ribs: baby back, spare, boneless country…the possibilities are endless! This entry was posted in Japanese, My Favorite Things, My Smoked Tea Obsession, Pork by Marina Chotzinoff. Bookmark the permalink.